On February 12, 2019 our Dear Lord graced heaven with another beautiful soul. Jean Beatrice (Wildman) Barna was born in Bridgeport, CT on August 14, 1930. She is the daughter of the late Starr and Augusta (Bedat) Wildman. Jean grew up in Newtown, CT. Her seven siblings are now welcoming her home again; Ruth Stevens, Florence Coddington, Ida Peterson, Alice Rutan, Edward Wildman, Donald Wildman and Clarence Wildman. 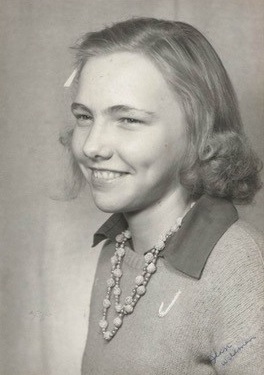 As a child Jean was a choir member of Trinity Episcopal Church in Newtown. She married Stephen Barna (Pete) on May 17, 1947. They shared their lives together for 68 years before Pete's passing. Jean, a very proud mother of 12 children and their spouses. Survived by, Stephen Barna Jr. & Kathy Bogus, Gloria (Barna) Dahill & Robert, Lawrence Barna & Maria (Geanuracos), Virginia (Barna) Koloski & Edward, Beverly ( Barna) Nelson & Wesley, Janet (Barna) Milczarski & Robert, Gary Barna & Charlotte Geanuracos, Darlene (Barna) Mastriani & Vincent, Bonnie (Barna) Blair & Brian, Denise (Barna) Day & Jeffery, Lisa (Barna) Arnold & Lee. She is predeceased by her son George Barna. And further blessed with12 Great Grandchildren, Austin Connors, Ashley Connors, Cameron DeMato, Jemma DeMato, Gianna Buzaid, Norman Buzaid IV, Nicholas Buzaid, Nora Blair, Logan Blair, McKenna Nelson, and soon to be Baby Pinckney & Baby Blair. Jean's other joys in life were watching gameshows, playing Bingo, listening to country music (her favorite song is Patches by Dickie Lee), watching the Yankees and taking long rides on country roads. She will always be remembered for her beautiful smile and how much she loved being around her family. She was always happiest when little ones were around. Which is something she inherited from her father, whom she loved dearly. Her favorite poem is Footprints in the Sand. Jean will forever be loved and remembered by those who were blessed to be a part of her life. May our beautiful, loving mother rest in peace forevermore surrounded by those she loves. Memorials in memory of Jean Barna may be made to St. Jude’s Children’s Hospital at St. Jude.org. A graveside Service will be held at Elmwood Cemetery, Bethel, Monday at 12:00 Noon. The family will receive friends at the Hull Funeral Home, 60 Division St., Danbury, CT, Sunday from 2:00 to 5:00.